And your hard-earned goods go to the house of an alien [as a result of adultery] (Proverbs 5:10). He [husband of adulteress wife] will not accept any ransom, nor will he be content though you give many gifts (Proverbs 6:35). And it shall be, if you are not pleased with her, then you shall let her go wherever she wishes; but you shall certainly not sell her for money, you shall not mistreat her, because you have humbled her (Deuteronomy 21:14). Then Joab said to the man who had told him, “Now behold, you saw him! Why then did you not strike him there to the ground? And I would have given you ten pieces of silver and a belt.” And the man said to Joab, “Even if I should receive a thousand pieces of silver in my hand, I would not put out my hand against the king’s son; for in our hearing the king charged you and Abishai and Ittai, saying, ‘Protect for me the young man Absalom!” (2 Samuel 18:11-12). Behold, I [the Lord] am going to stir up the Medes against them [Babylon], who will not value silver or take pleasure in gold . . . (Isaiah 13:17). Then the Gibeonites said to him, “We have no concern of silver or gold with Saul or his house . . . (2 Samuel 21:4). Do not eat the bread of a selfish man, or desire his delicacies; for as he thinks within himself, so he is. He says to you, “Eat and drink!” But his heart is not with you. You will vomit up the morsel you have eaten, and waste your compliments (Proverbs 23:6-8). And they come to you [Ezekiel] as people come, and sit before you as My people, and hear your words, but they do not do them, they do the lustful desires expressed by their mouth, and their heart goes after gain (Ezekiel 33:31). And his master praised the unrighteous steward because he had acted shrewdly; for the sons of this age are more shrewd in relation to their own kind than the sons of light. And I say to you, make friends for yourselves by means of the mammon of unrighteousness; that when it fails, they may receive you into the eternal dwellings. He who is faithful in a very little thing is faithful also in much; and he who is unrighteous in a very little thing is unrighteous also in much. If therefore you have not been faithful in the use of unrighteous mammon, who will entrust the true riches to you? And if you have not been faithful in the use of that which is another’s, who will give you that which is your own? No servant can serve two masters; for either he will hate the one, and love the other, or else he will hold to one, and despise the other. You cannot serve God and mammon. 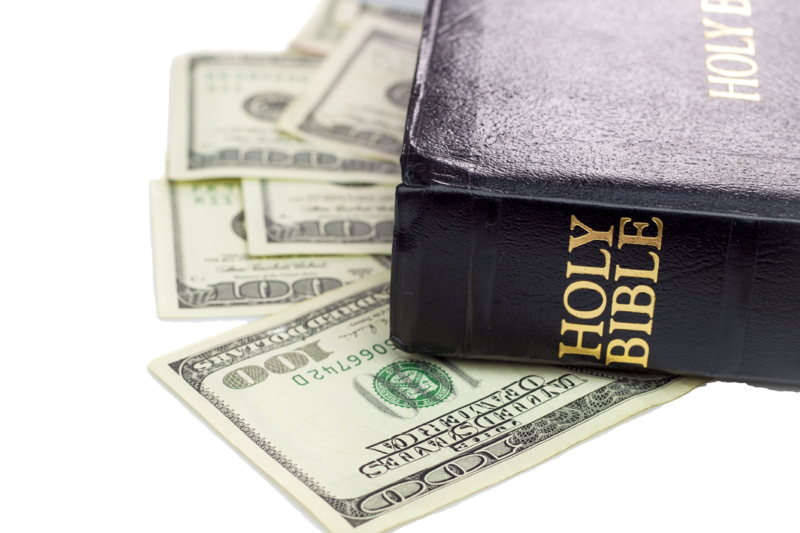 Now the Pharisees, who were lovers of money, were listening to all these things, and they were scoffing at Him (Luke 16:1-14).
. . . men of depraved mind and deprived of the truth, who suppose that godliness is a means of gain. But godliness actually is a means of great gain, when accompanied by contentment (1 Timothy 6:5-6). You lust and do not have; so you commit murder. And you are envious and cannot obtain; so you fight and quarrel. You do not have because you do not ask. You ask and do not receive, because you ask with wrong motives, so that you may spend it on your pleasures (James 4:2-3). Here for this third time I [Paul] am ready to come to you, and I will not be a burden to you; for I do not seek what is yours, but you (2 Corinthians 12:14). So Samuel spoke all the words of the Lord to the people who had asked of him a king. And he said, “This will be the procedure of the king who will rule over you . . . he will take the best of your fields and your vineyards and your olive groves, and give them to his servants. And he will take a tenth of your seed and of your vineyards, and give to his officers and to his servants. He will also take your male servants and your female servants and your best young men and your donkeys, and use them for his work. He will take a tenth of your flocks, and you yourselves will become his servants” (1 Samuel 8:10, 11, 14-17). And the prince shall have land on either side of the holy allotment and the property of the city, adjacent to the holy allotment and the property of the city, on the west side toward the west and on the east side toward the east, and length comparable to one of the portions, from the west border to the east border. This shall be his land for a possession in Israel; so My princes shall no longer oppress My people, but they shall give the rest of the land to the house of Israel according to their tribes (Ezekiel 45:7-8). I said to them, “If it is good in your sight, give me my wages; but if not, never mind!” So they weighed out thirty shekels of silver as my wages. Then the Lord said to me, “Throw it to the potter, that magnificent price at which I was valued by them.” So I took the thirty shekels of silver and threw them to the potter in the house of the Lord (Zechariah 11:12-13). And Baasha king of Israel went up against Judah had fortified Ramah in order to prevent anyone from going out or coming in to Asa king of Judah. Then Asa took all the silver and the gold which were left in the treasuries of the house of the Lord and the treasuries of the king’s house, and delivered them into the hand of his servants. And King Asa sent them to Ben-hadad [Syrian king] . . . saying, “Let there be a treaty between you and me . . . I have sent you a present of silver and gold; go, break your treaty with Baasha king of Israel so that he will withdraw form me.” So Ben-hadad listened to King Asa and sent the commanders of his armies against the cities of Israel (1 Kings 15:16-20). Rezin king of Syria and Pekah son of Remaliah, king of Israel, came up to Jerusalem to wage war . . . Ahaz (king of Judah) took the silver and gold that was found in the house of the Lord and the treasuries of the king’s house, and sent a present to the king of Assyria. So the king of Assyria listened to him; and the king of Assyria went up against Damascus and captured it . . . (2 Kings 16:5, 8-9). [to prevent Israel’s blockade] Asa brought out silver and gold from the treasuries of the house of the Lord and the king’s house, and sent them to Ben-hadad king of Syria, who lived in Damascus, saying, “Let there be a treaty between you and me, as between my father and your father. Behold, I have sent you silver and gold; go, break your treaty with Baasha king of Israel so that he will withdraw from me.” So Ben-hadad listened to King Asa and sent the commanders of his armies against the cities of Israel . . . (2 Chronicles 16:2-4). Then he [Boaz] said, “May you [Ruth] be blessed of the Lord, my daughter. You have shown your last kindness to be better than the first by not going after young men, whether poor or rich” (Ruth 3:10). He who withholds grain, the people will curse him, but blessing will be on the head of him who sells it (Proverbs 11:26). Better is he who is lightly esteemed and has a servant, than he who honors himself and lacks bread (Proverbs 12:9). Buy truth, and do not sell it. Get wisdom and instruction and understanding (Proverbs 23:23). If a man were to give all the riches of his house for love, it would be utterly despised (Song of Solomon 8:7). For thus says the Lord, “You [Israel] were sold for nothing and you will be redeemed without money” (Isaiah 52:3). How hard the gold has become, how the pure gold has changed! The sacred stones are poured out at the corner of every street. The precious sons of Zion, weighed against fine gold, how they are regarded as earthen jars, the work of a potter’s hands! (Lamentations 4:1-2). And He said to them, “Therefore every scribe who has become a disciple of the kingdom of heaven is like a head of a household, who brings forth out of his treasure things new and old” (Matthew 13:52). A woman who had had a hemorrhage for twelve years, and had endured much at the hands of many physicians, and had spent all that she had and was not helped at all, but rather had grown worse (Mark 5:25-26). The commander answered, “I acquired this citizenship with a large sum of money.” And Paul said, “But I was actually born a citizen” (Acts 22:28). Or what woman, if she has ten silver coins and loses one coin, does not light a lamp and sweep the house and search carefully until she finds it? And when she has found it, she calls together her friends and neighbors, saying, “Rejoice with me, for I have found the coin which I had lost!” In the same way, I tell you, there is joy in the presence of the angels of God over one sinner who repents (Luke 15:8-10). Ho! Every one who thirsts, come to the waters; and you who have no money come, buy and eat. Come, buy wine and milk without money and without cost. Why do you spend money for what is not bread, and your wages for what does not satisfy? Listen carefully to Me, and eat what is good, and delight yourself in abundance (Isaiah 55:1-2). Jacob’s sons came upon the slain and looted the city, because they had defiled their sister. They took their flocks and their herds and their donkeys, and that which was in the city and that which was in the field; and they captured and looted all their wealth . . . even all that was in the houses. (Genesis 34:27-29). The sons of Israel returned from chasing the Philistines and plundered their camps (1 Samuel 17:53). Now Ben-hadad king of Syria . . . besieged Samaria, and fought against it. Then he sent messengers to the city to Ahab the king of Israel, and said to him, “Thus says Ben-hadad, ‘Your silver and your gold are mine . . . the king of Israel answered and said, “It is according to your word, my lord, O king; I am yours, and all that I have.” The messengers returned and said, “Thus says Ben-hadad, ‘Surely, I sent to you saying, “You shall give me your silver and your gold and your wives and your children,” but about this time tomorrow I will send my servants to search your house and the houses of your servants; and it shall come about, whatever is desirable in your eyes, they will take in their hand and carry away . . . the elders and the people said to him (Ahab), “Do not listen or consent” (1 Kings 20:1-6, 8). Judah was defeated by Israel . . . [Jehoash king of Israel]) took all the gold and silver and all the utensils which were found in the house of the Lord, and in the treasuries of the king’s house (2 Kings 14:12, 14). When Jehoshaphat and his people came to take their [enemies] spoils, they found much among them, including goods, garments, and valuable things which they took for themselves, more than they could carry. And they were three days taking the spoil because there was so much (2 Chronicles 20:25). Since the days of our fathers to this day we have been in great guilt, and on account of our iniquities we, our kings and our priests have been given into the hand of the kings of the lands, to the sword, to captivity, and to plunder . . . (Ezra 9:7). [king Ahasuerus] granted the Jews who were in each and every city the right to assemble and to defend their lives, to destroy, to . . . plunder spoil (Esther 8:11). Thus the Jews struck all their enemies with the sword . . . but they did not lay their hands on the plunder (Esther 9:5, 10). Woe to Assyria, the rod of my anger and the staff in whose hand is My indignation, I sent it against a godless nation and commission it against the people of My fury to capture booty and plunder (Isaiah 10:5-6). So it will be that when the Lord has completed all His work on Mount Zion and on Jerusalem, He will say, “I will punish the fruit of the arrogant heart of the king of Assyria and the pomp of his haughtiness.” For he has said, “By the power of my hand and by my wisdom I did this, for I have understanding; and I removed the boundaries of the peoples, and plundered their treasures, and like a mighty man I brought down their inhabitants, and my hand reached to the riches of the peoples like a nest, and as one gathers abandoned eggs, I gathered all the earth . . . (Isaiah 10:12-14).
. . . [Babylon] will make a spoil of your [Tyre] riches and a prey of your merchandise . . . (Ezekiel 26:12). When the slain fall in Egypt, they [Babylon] take away her wealth . . . (Ezekiel 30:4).
. . . [the Lord’s judgment on Ephraim] will plunder his treasury of every precious article (Hosea 13:15). Thus says the Lord God, “An enemy, even one surrounding the land will pull down your strength from you [Israel] and your citadels will be looted (Amos 3:11).
. . . [Edom] do not gloat over their [God’s people] calamity in the day of their disaster. And do not loot their wealth in the day of their disaster (Obadiah 1:13). O how Esau will be ransacked, and his hidden treasures searched out . . . [because] you stood aloof, on the day that strangers carried off his [Israel’s] wealth (Obadiah 1:6, 11). Arise and thresh, daughter of Zion, for your horn I will make iron and your hoofs I will make bronze, that you may pulverize many peoples, that you may devote to the Lord their unjust gain and their wealth to the Lord of all the earth (Micah 4:13). Plunder the silver! Plunder the gold! For there is not limit to the treasure – wealth from every kind of desirable object . . . [Nineveh] is emptied . . . (Nahum 2:9-10). Woe to the bloody city [Nineveh], completely full of lies and pillage . . . (Nahum 3:1). Will not all of these take up a taunt-song against him [Israel], even mockery and insinuations against him, and say, ‘Woe to him who increases what is not his—for how long—and makes himself rich with loans?’ Will not your creditors rise up suddenly, and those who collect from you awaken? Indeed, you will become plunder for them. Because you have looted many nations, all the remainder of the peoples will loot you . . . (Habakkuk 2:6-8).
. . . all [the wicked] who weigh out silver will be cut off . . . their wealth will become plunder, and their houses desolate; yes, they build houses but not inhabit them, and plant vineyards but not drink their wine . . . Neither their silver nor their gold will be able to deliver them on the day of the Lord’s wrath . . . (Zephaniah 1:11, 13, 18). The remnant of My people will plunder them [Moab] . . . (Zephaniah 2:9). Men give gifts to all harlots, but you give your gifts to all your lovers to bribe them to come to you from every direction for your harlotries. Thus you are different from those women in your harlotries, in that no one plays the harlot as you do, because you give money and no money is given you; thus you are different (Ezekiel 16:33-34). To Sarah he [Abimelech] said, “Behold, I have given your brother [Abraham] a thousand pieces of silver; behold, it is your vindication before all who are with you . . . (Genesis 20:16).